In partnership with Cranfield University and Bosch Rexroth this is an ongoing project for development of the next generation of wind turbine technology. Whilst the project is still subject to strict confidentiality agreements suffice to say that the turbine is a vertical axis unit which will has significant potential for both commercial and domestic applications. Cambridge Dynamics has designed the nacelle for this unit and the contract for the manufacture of the units is in progress. 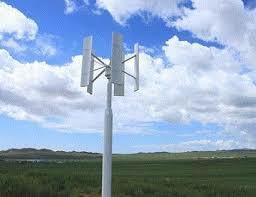 A typical vertical axis wind turbine is shown below.